The word Geisha means an artist and female entertainer. It fully reflects the role of Geisha in Japanese society. These mysterious women arouse admiration and curiosity as they quickly pass the streets. Their faces are hidden behind a strong and at the same time elegant makeup. Everyone wants to take a picture of them, look at beautiful kimono, a complicated hairstyle and colorful accessories. They are treated like stars, and their appearance arouses a stir. Few people are aware, however, of how much work and sacrifices the profession of Geisha requires. It is not easy to meet a Geisha in Japan. At the beginning of the 20th century, there were 80,000 Geisha in the entire country. With the changing world, the adoption of Western customs and lifestyle, the number of Geisha has drastically diminished. 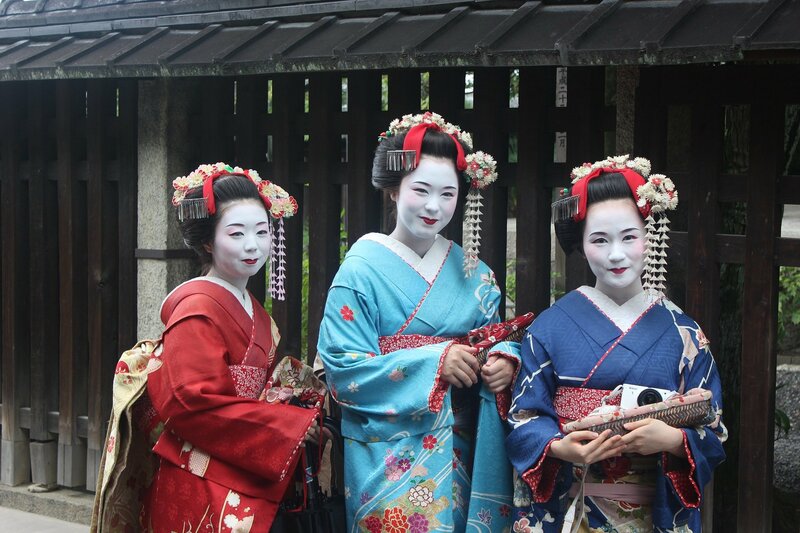 There are currently less than 200 Geisha, the most are in Kyoto – the ancient capital of Japan. Kyoto is a very special place where the most traditional Japanese customs, arts and crafts are cultivated. Kyoto did not suffer during war bombing, which is why several hundred years old wooden houses and temples have survived. Some residents wear kimonos every day. This is unusual because nowadays kimonos are used only during holidays and important events. Anyone who wants to get to know real, traditional Japan has to go to Kyoto. Maybe he will even meet a real Geisha? The best chance for that we have in the Gion district. It is the largest traditional district in Japan. There are tea houses – Ochaya (although usually there is no tea there) and exclusive restaurants. Usually we do not know that Ochaya is in a particular home. There is no menu or banner outside the building. This is because not everyone has access to them. You must receive a special invitation. Politicians, business people, local entrepreneurs meet there and they are accompanied by Geisha. 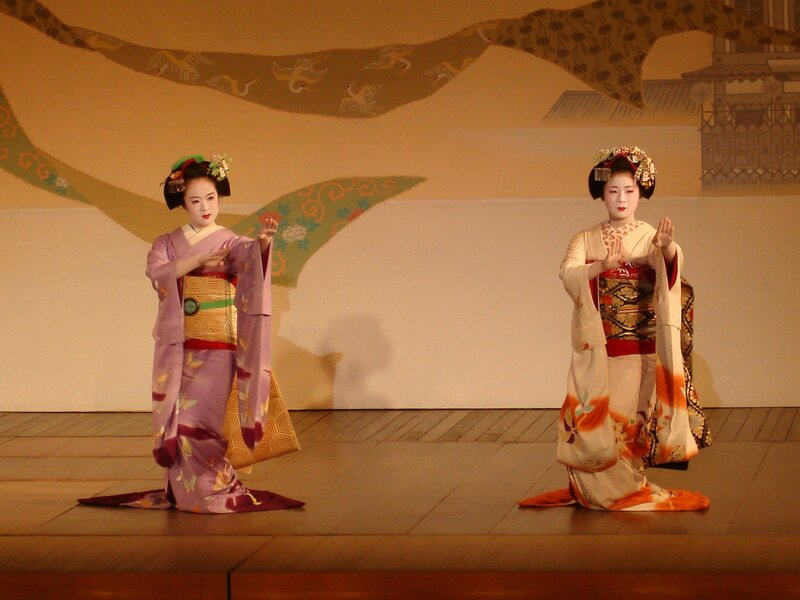 Geisha are divided into Maiko and Geiko. Geiko is a full-fledged Geisha who has finished her education. Maiko, on the other hand, is a student who is still improving her craft and is less than 20 years old. You can tell the difference between Geiko and Maiko by how they dress. Maiko are dressed in vivid, colorful kimono, and their hair is decorated with large flower-shaped ornaments. They wear traditional footwear on 10-centimeter platforms. Geiko dresses kimono in more subdued colors, and in the hair they have only one or two decorative hairpins. They also wear ordinary Japanese sandals – geta. The world of Geisha is very formal and has strictly defined rules. 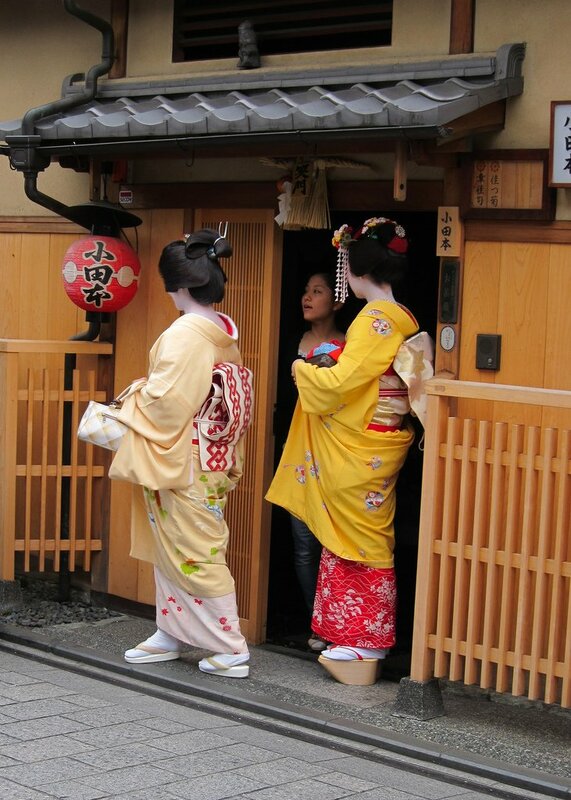 Maiko and Geiko’s task is to entertain guests and create a pleasant atmosphere. They serve sake, make small talk and play traditional games with the guests. They also present an artistic program, different types of dance accompanied by shamisen – a traditional Japanese instrument. Geiko and Maiko are called Kyoto flowers. They cultivate the ancient traditions of Japanese hospitality. Meetings organized in Ochaya are social events that not only serve entertainment. Tea houses are often used as places for conducting business negotiations. It is a Japanese custom to conduct conversations with colleagues and contractors in a more relaxed atmosphere, sipping alcohol. Perhaps it is easier then to negotiate favorable terms? It imposes a certain rule on Geisha. They can not tell anyone what they hear in the Ochaya banquet room, all business talks are strictly confidential. The most important rule is never reveal the secrets about guests. The road to becoming a Geisha is very long and difficult. Young, up to 15-16-year-old girls leave their family homes and move to the houses of Geisha – Okiya, which are run by older Geisha or the owner of a tea house. Training lasts about 5 years and during this time they only have contact with another Maiko, Geiko and Ochaya’s guests. The achievements of modern civilization, such as mobile phones or laptops, do not fit into the traditional image of Geisha. The girls do not have these devices, and they write letters to their families. They also have no time to visit their homes, as they have only 2 free days a month. Maiko go to school every morning. They learn traditional dances, songs, playing instruments. They study traditional arts and cultural practices, like the tradition of making tea and arranging flowers, all under the guidance of prominent teachers. Geisha must have impeccable manners and graceful movements. It is important how they move, stand, raise the cup with tea to their lips. Every move must be made with grace and calmness. 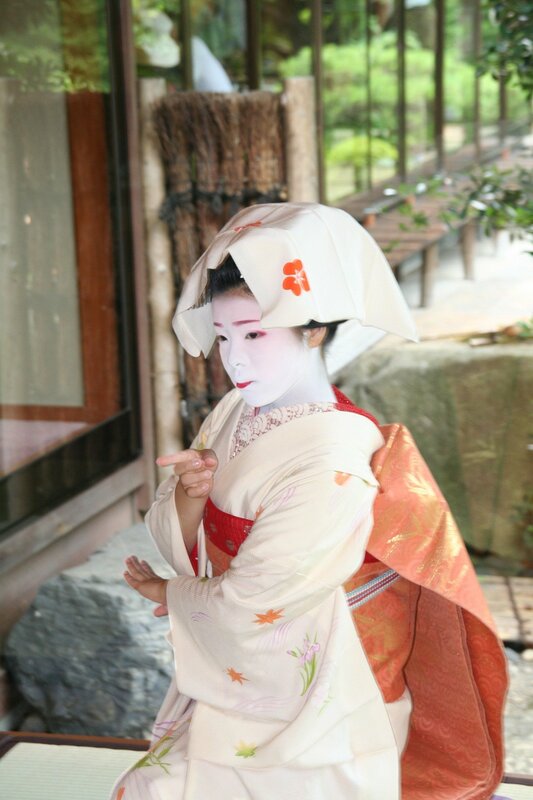 The Geisha schedule is full of activities from morning to evening. Then they go to work to tea room. Geiko meet representatives of various professions there and must be able to conduct a conversation so that the guest can feel their commitment. Even when topics are discussed that Geiko have no idea about. The standard Geisha’s work day ends after midnight. The look is very important. Geiko and Maiko have a characteristic white powder that blends well with a colorful kimono. The younger Geiko or Maiko, the more red in the makeup she uses, especially on the lips. She uses traditional cosmetics and make-up accessories. Their faces are characterized by a strong contrast of black, white and red. The choice of kimono is also important, they usually have seasonal, natural motifs. Geisha change their costumes so that they fit the season. The hairstyle is make by a professional once a week. During this week her hair must keep the perfect shape, so Geisha do not use pillows. They put under the head a small wooden stand, on which there is a piece of material. Geishas are artists and artists surround them. Kimono makers, footwear makers, hair ornaments makers, hairdressers. All these people continue the craft that has been cultivated in their families for generations. At age 20, Maiko finishes her training and can become Geiko. Before this happens, he has the last chance to give up. The life of a geisha is not divided into professional and private, it is done 24 hours a day. So you have to make a choice. Geiko can not officially have a partner or husband. When she gets married, she loses Geiko status, like she never was a Geisha. After so many years of hard work and sacrifices, making such a decision must be very difficult. The life of a Geisha follows the rules from another world. No wonder that fewer and fewer women decide to be Geiko. In old times, the profession of Geisha allowed women to be independent. In a men’s world, women have only few possibilities for creating their own life. Today Geisha profession is associated with many sacrifices. Still, there are young girls who want to continue this tradition. There is hope that there will be more and more of them, because in many cities actions are being taken to rebuild the districts of Geisha. It is also a way to attract tourists, and Geisha with their dance and gaming skills go out to ordinary people to familiarize them with Japanese traditions.